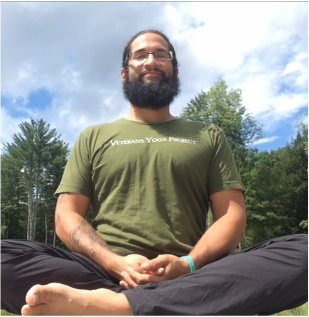 U.S. Army Veteran Rafael Rivera, from Baldwin, NY discovered the practice of yoga after being inspired by a fellow Veteran's online transformation. Struggling through Post Traumatic Stress along with transitioning home in 2012 in time for Super Storm Sandy; the practice saved his life. After almost two back to back years in Afghanistan, once deployed with the 372nd MP Company as a driver and mechanic and once more as a civilian contractor working with Ideal Innovations Inc. on the Force Protection Program. Both experiences had their unique challenges and they took a toll on the mind, the body and the soul. Having discovered the practice through Restorative and Gentle Flow yoga; Rafael continues to focus on the slower more nurturing aspect of the practice. Ranging from novice level classes, to open level mixed with Yin yoga, the style of teaching is slow and strong with an emphasis on alignment and safety so that students may get the most out of their practice.